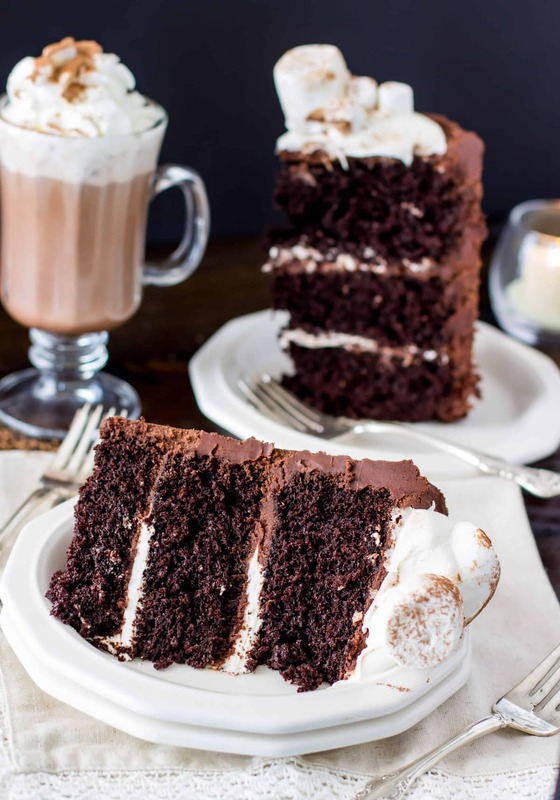 An intensely rich chocolate cake made with one and a half cups of real hot chocolate, iced with cocoa frosting, and layered with marshmallow buttercream. Make it as a three layer 6″ cake, or a two layer 8″ or 9″ cake. I was going to write about how my great-grandmother passed away last week, but I wasn’t sure how to do that on my blog. Here, I try to revolve my stories around food, and the death of a loved one doesn’t have much to do with chocolate cake. I wanted to write about how we celebrated her life, her humor, and her faith last night while at the same time we mourned her loss. Family and friends packed into the too-warm funeral parlor, dressed in itchy black and gray clothes, and my sisters and I made sure to wear leggings under our skirts because, were she alive, Mom-Mom would have commented loudly about the indecency of the “short” skirts that brushed modestly at our knee caps. Instead, it would be more appropriate to devote this post to talking about how rich this cake is, shamelessly using the word moist because it is saturated with chocolate, melting in your mouth, decadent; but all that’s coming to mind currently is fettuccine noodles in pools of grease-speckled tomato sauce, ladled onto my plate by her shaking hands as she reminded me for the twelfth time to “Make sure you have enough to eat”. I’d want to write about her last birthday, her 101st, tuned to the theme of 101 Dalmatians. Or how She loved God, her family, and the Orioles. How many things she saw in 101 years, from the Great Depression to iPhones. This space is more appropriate for talking about cakes, though. Did I mention this cake is accented with a marshmallow buttercream? It’s buttery and smooth and meant to mimic the baby marshmallows that I overload into my mug each time I make hot chocolate, coaxing them under the cocoa surface with a spoon until they are slippery and disintegrating. The pictures here don’t do justice to the flavors. Pictures. There were so many pictures in the funeral parlor. Not 101 years worth, but the highlights. 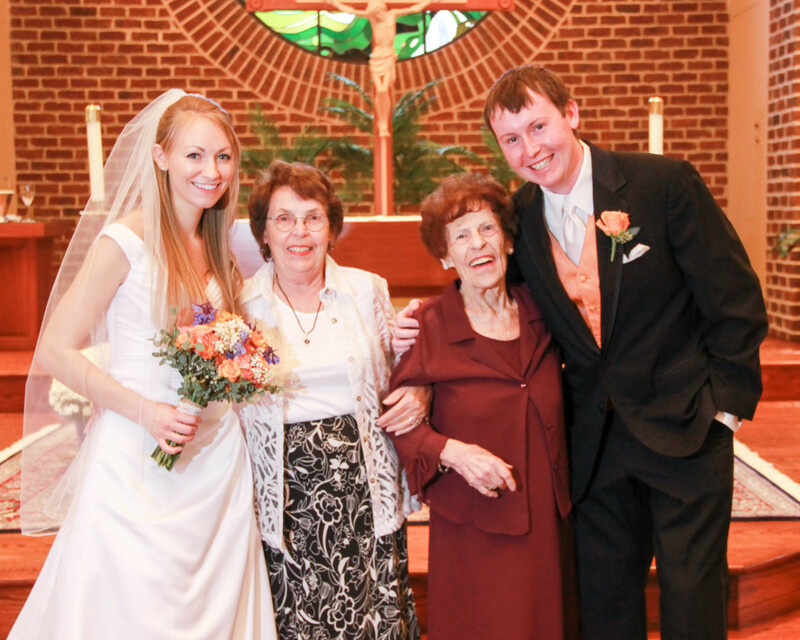 So many smiles in black and white and in color, 5 generations surrounding her, lots of pictures of her dancing, even at my wedding just over a year ago. My favorite photo was not that, or any other staged one. 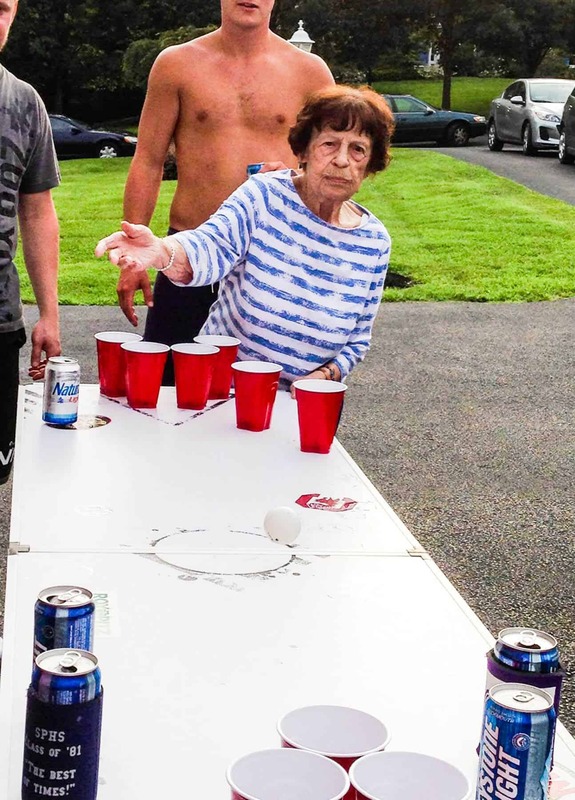 My favorite was one taken when she was 98; in it two of my college-aged cousins look on as she tosses a ping pong ball toward a triangle of red plastic cups. It looks like she just crashed a beer pong tournament at a frat house. The picture was probably snapped quickly with a phone, but the photographer immortalized her spirit in the moment just after the toss, determination firm on her face, the ball aimed squarely for its target. She was a good shot, evidently. I think I’d feel inclined to note that Death at 101 years is not a shame, and it’s certainly not a tragedy. No long illness kept her shackled to a hospital bed; she was spritely and full of humor, happy and so grateful for life until the end. But it’s still sad to lose a loved one, no matter how prepared you think you were, to register the finality of death and what it means for future family gatherings. We mourn for the loss of her laughter and jokes and attempts at rapping at Christmas, for the loss of her fiery presence. We mourn for ourselves, more than anything. Instead I should write about this cake. Besides, what could I say in a post that could do justice to the legacy left from over a century of well-lived life. It just wouldn’t be possible. 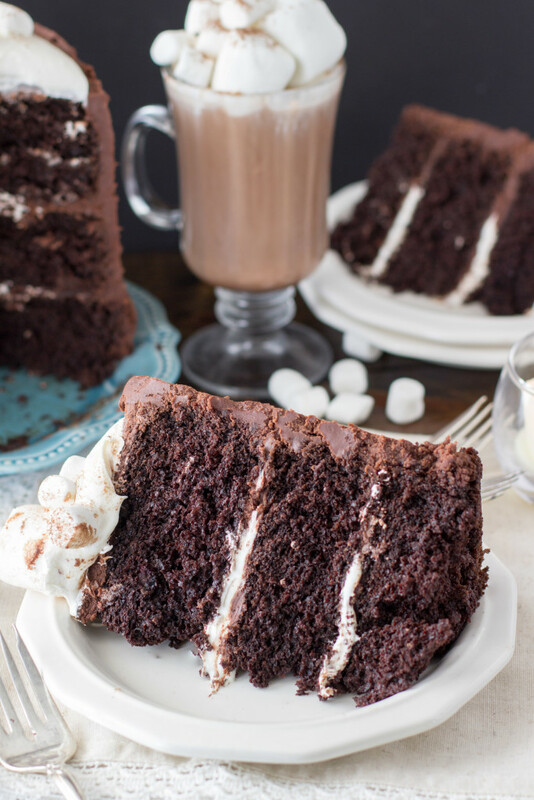 This hot chocolate cake is really, really good. 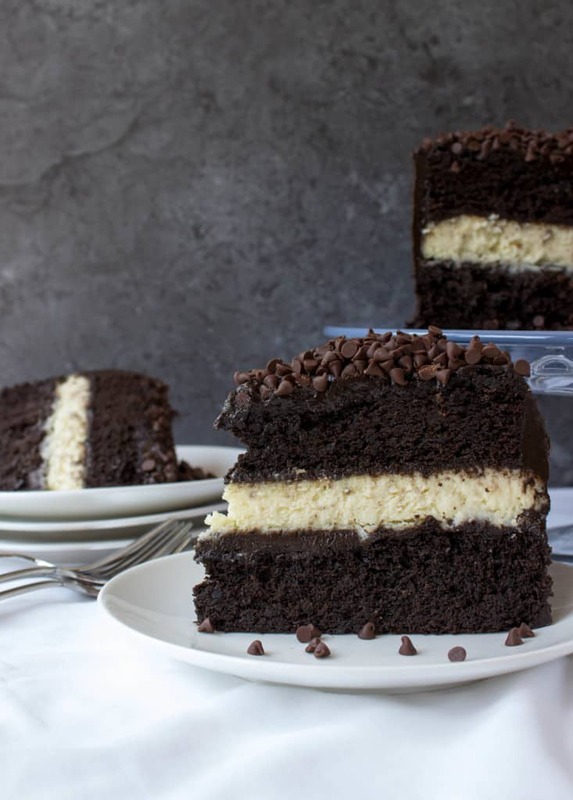 Makes either a 2-layer 8" or 9" cake, or a 3-layer 6" cake. Baking times will vary and are indicated for each size below. Preheat oven to 350F and prepare cake pans by lightly but thoroughly greasing and flouring. 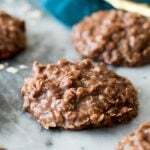 In bowl of KitchenAid mixer (or in large bowl if using hand-mixer) whisk together sugar, flour, cocoa powder, baking powder, baking soda, and salt. With mixer on low speed, stir in canola oil and water. 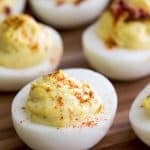 Increase speed to medium and add eggs, one at a time, beating between each addition until well-combined. Gradually add hot chocolate to bowl, stirring in manually. Return to KitchenAid (or to hand-mixer) and stir on low-speed until well-combined (pause occasionally to scrape sides and bottom of bowl to make sure ingredients are combined completely). Evenly divide batter into prepared pans (do not fill more than 3/4 full, if you have excess batter, discard). If using 8" or 9" pans: bake on 350F for 25-30 minutes (until toothpick inserted in center comes out clean or with few crumbs). If using 6" pans: bake on 350F for 40-45 minutes (until toothpick inserted in center comes out clean or with few crumbs). Once finished baking, allow cakes to cool in pans for 15 minutes. Run a butterknife around the inside rim of the pan to loosen the cakes and then invert onto cooling racks to remove from pans and allow to cool completely before frosting. Measure out your milk and set aside. 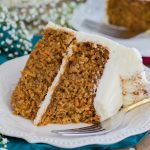 While cakes are cooling, prepare frosting by beating butter on medium speed (with KitchenAid or hand mixer) until well-creamed. Add cocoa powder and 1 cup of powdered sugar, beat on low speed until it begins to combine. Add approximately half of the milk and the vanilla and beat on low speed until ingredients are creamed together. Add the remaining powdered sugar, stir, and then add remaining milk, stirring until ingredients are creamed together. Be sure to scrape sides and bottom of bowl to ensure ingredients are well-combined. 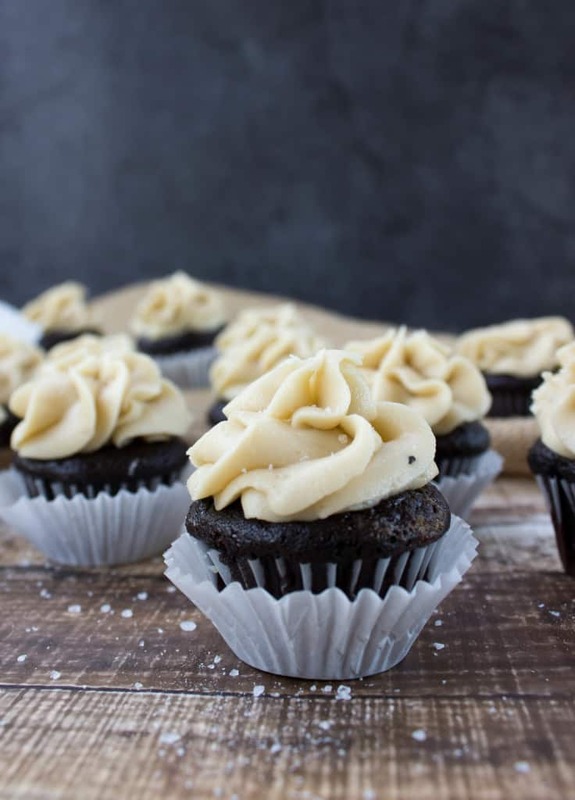 Set aside chocolate frosting and prepare marshmallow buttercream. Cream together butter and marshmallow fluff. Gradually add powdered sugar until combined. 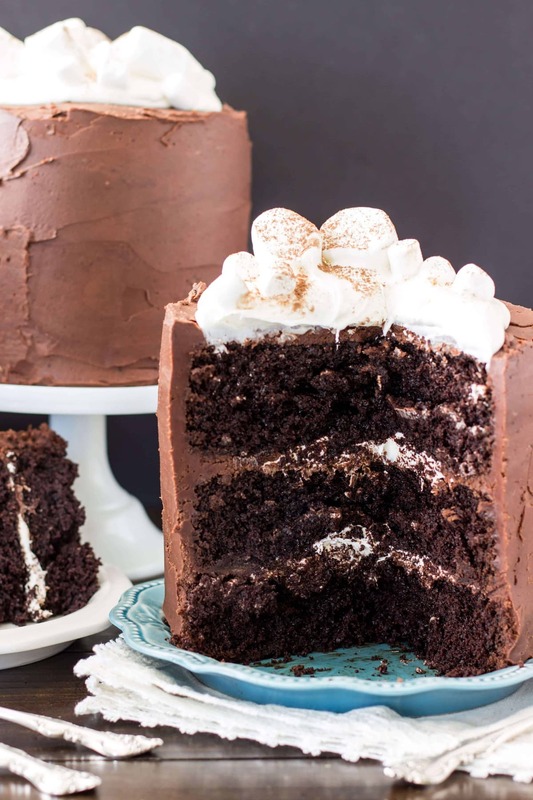 Once cakes are completely cooled, prepare by icing each layer with chocolate, applying the chocolate most heavily 1" around the edges and creating an indent or "nest" in the center for the marshmallow fluff. Spread or pipe marshmallow fluff into the indent created with the chocolate frosting, and then top with the next layer and repeat. 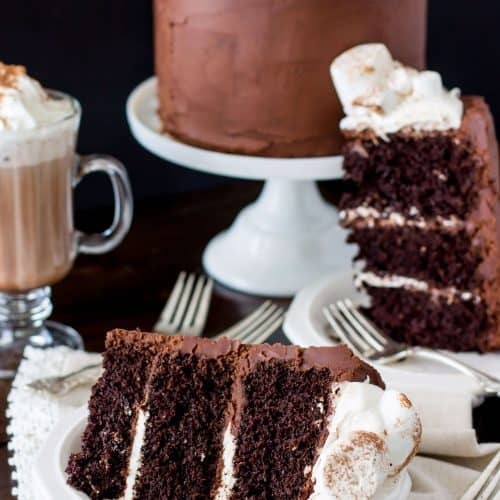 Ice the entire outside of cake with the chocolate frosting and pipe or spread marshmallow buttercream on the center of the top. Just before serving, top with marshmallows for decoration (if desired) and serve. I had to add a little milk to the marshmallow buttercream….. before the milk it was just super stiff and clumpy…. the milk made it perfect! 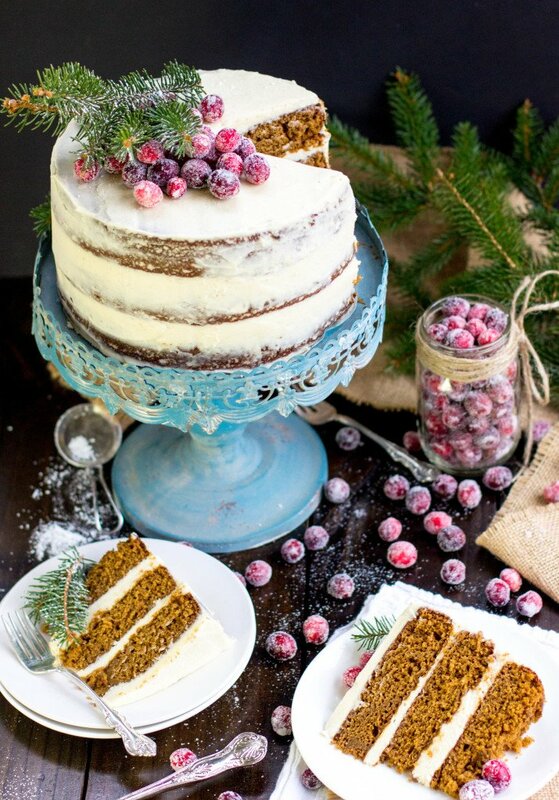 Do you think this cake would work with your vanilla buttercream frosting? My sister is wanting a two tiered cake for her daughter’s first birthday (one tier white, the other chocolate) so I’m needing to keep the frosting consistent. Any suggestions would be much appreciated! 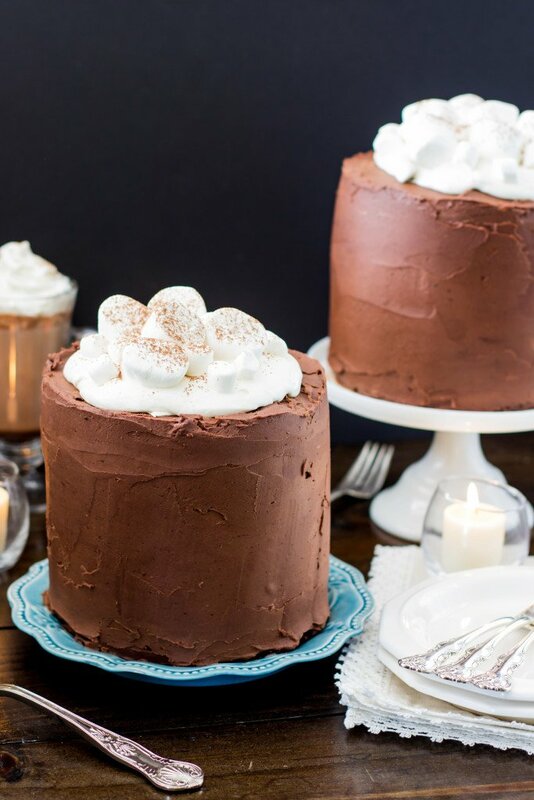 Can the marshmallow buttercream be made a day ahead? 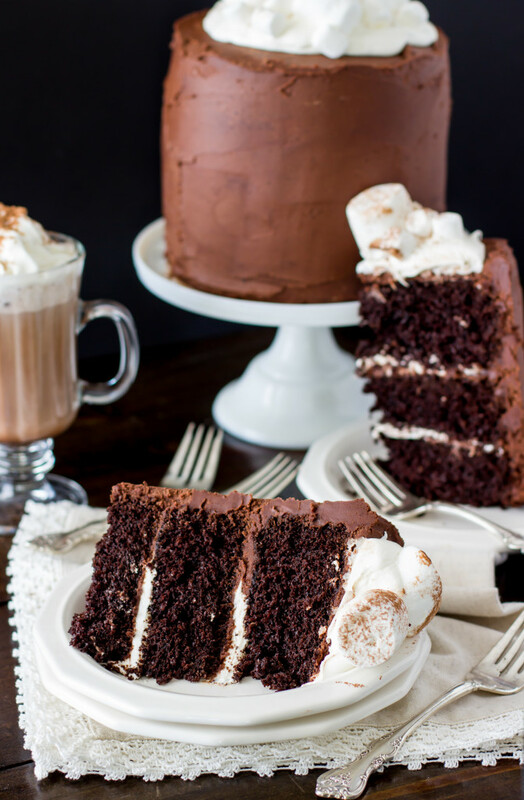 I am taking a hot cocoa bundt cake to work & want to give folks the option of using a marshmallow frosting – your recipe sounds super yummy! – which would be served in a bowl on the side. Would this frosting stand up to that? I don’t think that would be a problem at all! Hope you love it! Ummm. I used 3 six inch pans, was careful to only fill 3/4 way full.. they are up over and all over my oven. Checked all measurements twice. Any suggestions? Nevermind. Batter started an oven fire that would not quit. Had to put it out with a fire extinguisher. LOL! I’ll try again after new years. OMG! Yikes! Sorry to hear about that… I have never had my cake rise so much/overflow and I make this one frequently so I’m afraid I’m not sure what may have gone wrong. Sorry to hear about your fiasco!! My batter seems super thin – is that right? About to put this cake together but I’m curious if the cocoa you used for the frosting is unsweetened or hot cocoa mix? Thank you! Hi Stacey, sorry I’m just now seeing this, I just use unsweetened cocoa powder for the frosting.